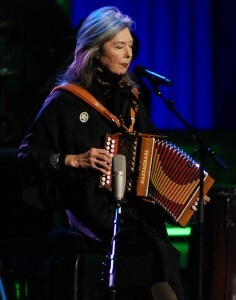 Canadian folk singer-songwriter Kate McGarrigle passed away last night after a three year battle with cancer. While she’s probably best known now for being the mother to Rufus and Martha Wainwright, Kate herself has been performing and releasing albums since the 1960s, largely with her sister Anna. Kate and Anna were appointed Members of the Order of Canada in 1993, and in 2004 received the Governor General’s Performing Arts Award. While her health had been improving, it had been reported that she was ill again late last year, and Rufus recently cancelled his Australian tour in order to be with his mother. Kate established the Kate McGarrigle Fund in 2008, which supports cancer care and research at the McGill University. As a long-time fan of the creative output of the Wainwrights and McGarrigles and the whole rest of the clan, my sympathies are with her family and friends. Kate was certainly loved and respected by many; that much is evident any time you see video of her performing with her family. Gifted with not only an extraordinary musical talent but also a wicked sense of humor, Kate will be missed. Rufus has posted his own note about his mother on his website. Donations to the Kate McGarrigle Fund in her memory and to support cancer research can be made online.